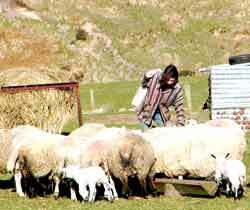 The Rhanich Farm is a commercial hill farm in the North of Scotland run jointly by Pam Shaw and Donald Clarke for nearly 40 years. Pam comes from Hastings and has always wanted to live on a farm and keep animals. Donald was born and raised on a farm next-doors to the Rhanich in Edderton. They met on a commune in Wales in the early 70’s. AND volunteer helpers and agricultural students. Click on the thumbnail below to see the location of the Rhanich. Farm life involves the hill and the sea. From its perch at 120 meter above sea-level, the Rhanich overlooks the Firth of Dornoch. In winter that sometimes means that the snow stays on the ground longer than it does in the valley by the sea. But in summer the sea mists (the “haar”) often keep Tain and Edderton under a damp cover while the Rhanich gets the sun above. On clear days, Pam and Donald can see as far North as Ben Hope on the North coast of the country some 100 miles away. In winter it is common to see the Northern Lights (Aurora Borealis) during the long nights while in mid-summer the sky never really gets dark at all. At latitude 57.801, the Rhanich is level with the tip of Denmark and Goeteborg in Sweden and just below the latitude of Juneau, the capital of Alaska. There are a few fields near the house "in-by" that have been improved to lush grass but most of the land surrounding the farm is heather and rough grazing. 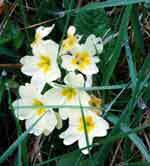 Wild ducks, curlew, partridge and birds of prey are seen frequently. Because of the grain stores there are armies of sparrows and other small song birds hanging around the house and stables. Jackdaws and crows frequent the farm in large numbers and across the valley a pair of ravens have been nesting for a few years. Just across the valley lies Morangie Forrest which is one of the last refuges of the endangered cappercaillie. Donald says he's never seen any "Capper" on his hills though; but he has seen the equally rare Black Grouse on occasion. I have found roe-deer antlers in the adjoining forestry and the skull of red-deer in the fields. Foxes sometimes stalk the back of some of the in-by fields at lambing time. Donald also owns fields in Edderton and by the sea (i.e. the Firth of Dornoch). The fields are next to a designated area for the protection migratory birds (bar-tailed godwit and greylag goose) who use the mudflats to rest and feed. Icelandic swans regularly stop by on the fields by the sea on their seasonal journeys. The Firth is known to be visited by seals, dolphins and even the occasional whale. The area around the Rhanich has been home to people for a very long time. A Pictish stone with the carving of a fish can be found in a field in Edderton, the local village and another stone stands by an old church next to some of the Rhanich's shore-side fields. Ancient chambered cairns, hut circles and brochs are dotted around the area. All are testimony that ancient man found this an ideal place to live : the sea for food and transport at his doorstep and the hill for shelter and for grazing his animals behind him. Reputedly, "Rhanich" means "place of weeping". Since before the early middle ages, the North East of Scotland had been under permanent threat from Viking marauders who would sail across from Norway or up from their English colonies (e.g. York) and pillage the small communities that were settled by the sea shore. 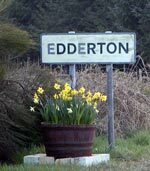 Edderton, the village below the farm, seems to have been raided regularly. When this happened, the villagers would flee into the hills, perhaps following the "Black Burn" until they were safely hidden behind several bends in a deep ravine formed by the burn. There they would wait until the Vikings had departed and while they waited they would no doubt weep for the loss (yet again) of their harvest and their livestock - if not indeed for the loss of anyone who might have been left behind in the panic. The land that is now the farm at one time held about 4 buildings and there are ruins of houses and animal enclosures that can still be seen. At the Eastern end of the farm lies a hillock called in Gaelic "Cnoc nan Gaimhnean" which has an old cairn (pile of rocks) on its side. "Cnoc" is the word for a rounded hill and "Gaimhnean" means young male calve or stirk. In the past, cattle from the North of Scotland used to be "driven" to markets in the South by walking them along established routes over land for many days or even weeks. One of these "drove routes" went over Cnoc nan Gaimhean and the cairn may well be a way-marker for the drovers. The hill was an established place to rest the cattle over night. And because sleeping in the heather is very romantic but not very comfortable, an entrepreneurial spirit very soon built an ale house near the hillock where the drovers could get a pint and a soft bed if they could afford it. The "Aultnamain Inn" was still run as a pub until the 1990's when it was converted to a private house. Since the beginning of their life at the Rhanich, Pam and Donald have had the help of countless enthusiastic volunteer helpers. 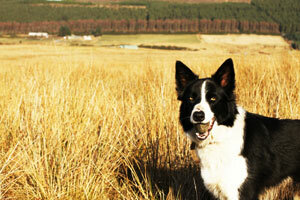 The Rhanich has been member of the international Willing Workers on Organic Farms (WWOOF) scheme since 1981. Lately, they have been getting a lot of helpers through a German website called www.Ecojobs.de which has been very welcome. 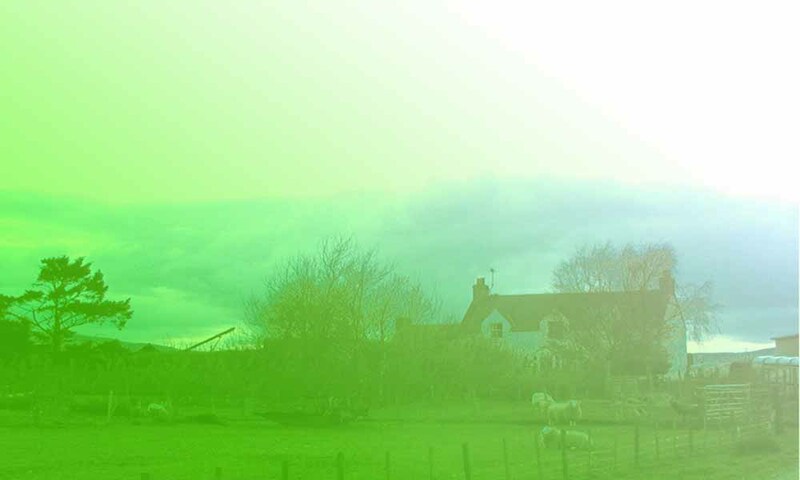 If you are a volunteer and you would like to know more about how to get to the farm, what to bring and what to expect, check out the Volunteer Helpers' Info Pages and have a look at the Gallery of Helpers. Tain is the nearest town to the farm. 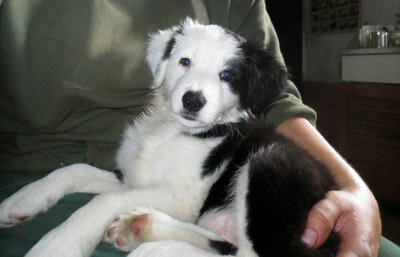 The vet is in Tain and so is the local supermarket, pharmacy, banks. It is possible to cycle to Tain - if you like cycling! Dornoch is located just North of Tain on the other side of the Firth of Dornoch. Famous for its golf-course, it is a little medieval town with some cafes and gift shops. There are two Whiskey distilleries in the immdieate area that can be visited: Balblair (in Edderton) and Glen Morangie (in Tain). 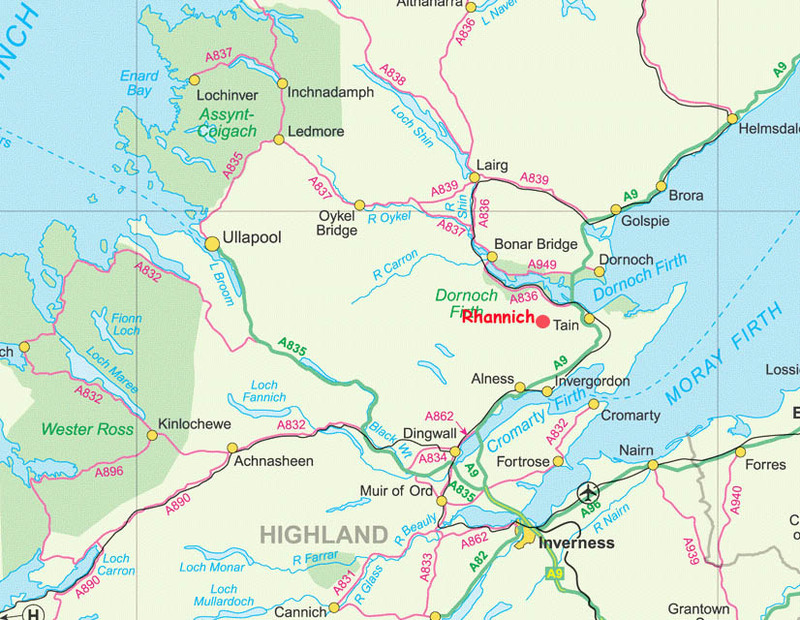 Further afield are Dalmore (Invergordon), Glen Ord (Muir of Ord) and Tomatin Distillery (Tomatin just South of Inverness). Inverness is the "capital of the Highlands" and there are buses that go from Tain to Inverness. Apart from the River Ness, shops, tourist information and a castle with a museum, Inverness can also be useful as a gateway for daytrips to Loch Ness, Cawdor Castle (of Macbeth fame) or Culloden Battlefield (where the last land based battle in the UK was fought in 1745).